Many people owe their service are forced to drive on long trips, and for this they need to take a laptop that contains all necessary information for work. But the permanent removal of the appearance of the laptop will deteriorate. In order that its appearance is preserved, it is necessary to buy a case or a special bag for it. But would you personally like something new and unusual, in General, do not like at all. Case for laptop, made independently, will look very original and stylish. 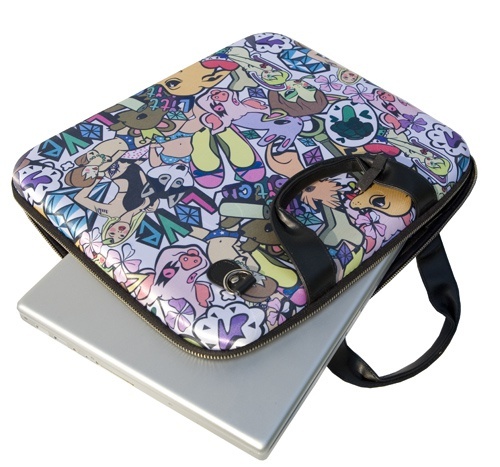 Select fabric and colors for the future of the case on the laptop. A good option for this case will be thin leather or suede, you can certainly use fabric, but not necessarily thick cotton or upholstery. Measure the dimensions of your laptop (length, width and thickness). Make according to the size of the pattern, which must consist of two rectangular parts, with one part of the pattern should be about 10 cm longer than the other. Cut the fabric into rectangles according to the pattern, you can still cut on the same pattern lining and a layer of vinyl or dense plastic film for waterproof. Fold each part of one side of the pattern, for example, the main fabric, then a thick plastic film, a thin layer of batting or wadding and a backing cloth, do the same with the second part of the pattern. Prostrochite on the perimeter first, one part of the pattern, making allowances of about 3 cm, and then the second part of the pattern. Now that I have the elements you need prosteride using any pattern. Then smoothen the edges with binding. Connect the two parts of the pattern and sew them. After you sew the Velcro strip with one piece of tape is sewn to close the valve, and then to the base of the envelope. You can use the buttons or buttons with the flare loops, but the loop is not always appropriate, if you frequently open the case. Case for laptop - not only a useful thing for you and can be a good gift for family and friends, because it is made by hand. Of course, you can come up with a variety of finishes, for example, for women it can be decorated with beads or stones that give it a sophistication and originality. But for men, it is desirable to choose a more strict tone to cover, this will give it greater solidity.